Recently, my baby brother (he’s 26 can I really still call him a baby!?) popped home for a visit from school with 2 of his friends. Knowing they’d be hungry after a long drive, I made them this incredibly easy (but tasty!) 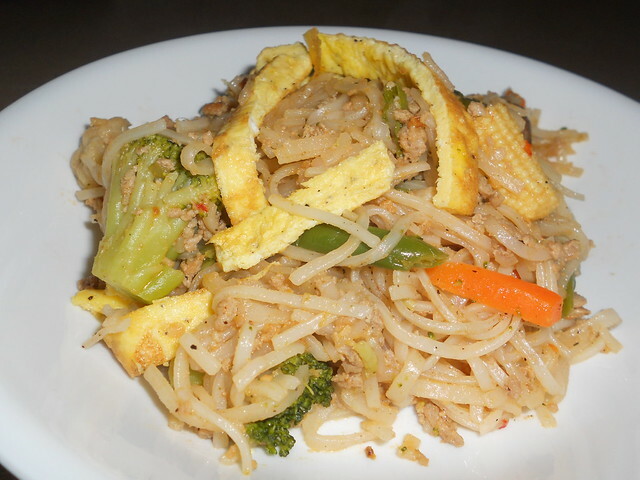 stir fried noodles. It’s more of a kitchen sink/left overs type dish because everything I needed, I already had. Plus you can throw in whatever you’d like, in this instance I used ground turkey and some pre-cut frozen veggies I had in the freezer. I’m all about fresh ingredients but in a pinch for my weekday meals, frozen veggies are great. Topping the whole thing off with a thin omelet, very Cambodian (btw) to top off your noodle dishes with thin ribbons of egg. 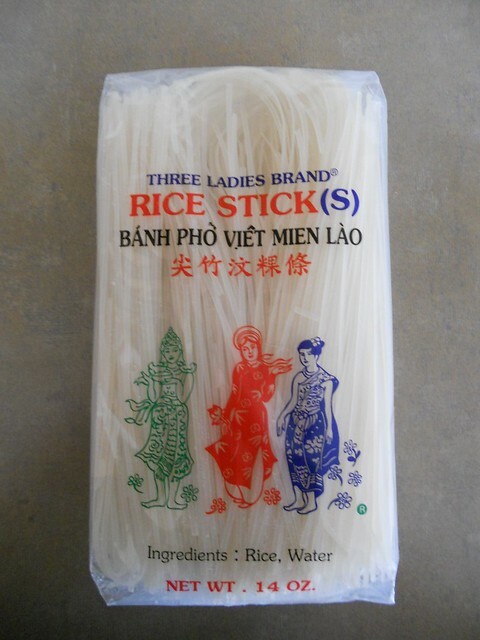 I used a flat rice noodle (Banh Pho) you can find in any Asian grocery store, or possibly the Asian isle in your local supermarket. They’re a pantry staple for my family, because they last forever and we can use them in soups or stir fried applications. Other pantry items on hand: Oyster Sauce, Fish Sauce, Sugar, Black Pepper, Sambal Oelek (garlic chili sauce), Fried Garlic Chips, Eggs, Lime Juice and Oil. Notice there’s no salt, oyster sauce and fish sauce are both very salty on their own, you don’t need to add any extra, but if you’d like more or less salt, adjust your measurements of fish sauce. Crack 6 whole eggs into a bowl, add water, salt and pepper. Whisk briskly to incorporate all ingredients and promote bubbles. 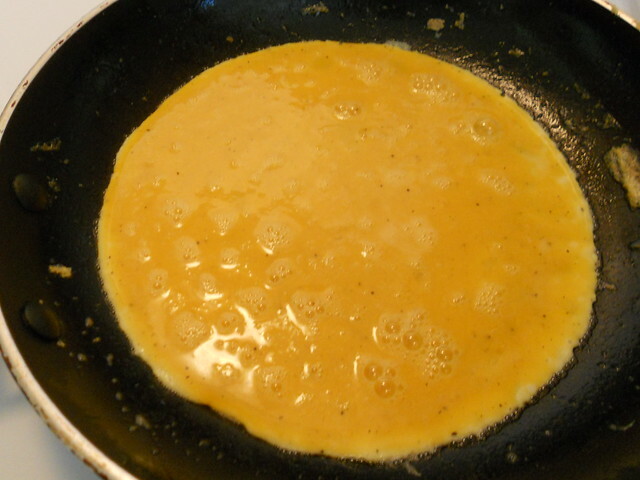 Heat a small saute or omelet pan on medium heat with 1 tsp of oil, add half of the egg mixture and twirl pan to evenly coat the bottom and create a thin omelet or crepe. Cook low and slow until the top is almost set and the bottom brown and crisp. 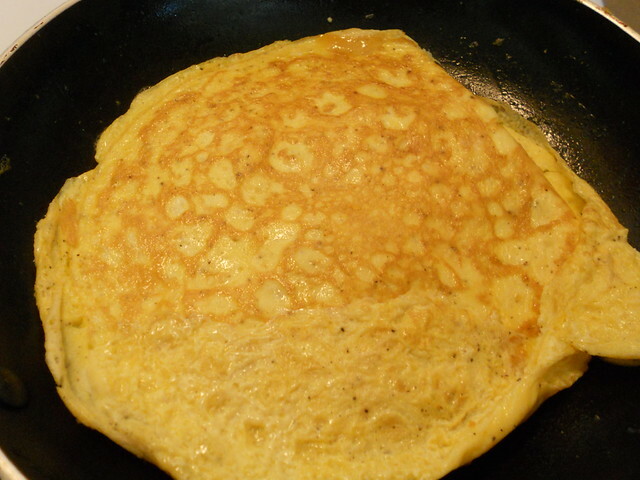 Flip the omelet to cook the other side, remove to a plate to cool and repeat cooking steps for the 2nd omelet. After cooled, cut the omelet in half then into thin ribbons. 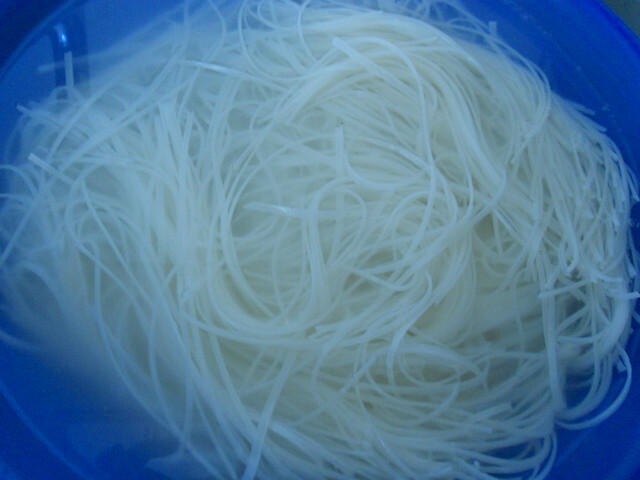 First soak your rice noodles in hot tap water for 6 minutes, drain and set aside. This softens them and prepares them for cooking. Very important step to get that right chewy noodle feel in your mouth. In a wok or large saute pan on medium high heat, cook your ground turkey in (rest of) the oil until done. Add your oyster sauce, fish sauce, sugar and sambal. Stir to coat the turkey in all the spices, add frozen veggies and continue to cook until veggies are warmed through. There should be a good amount of water given off from the veggies at this point. 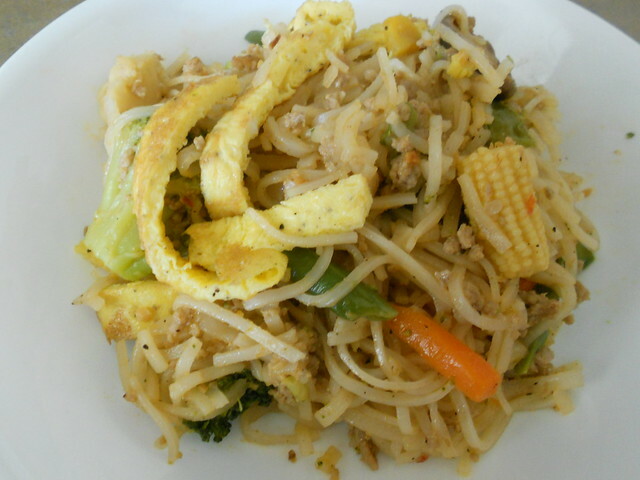 Add your drained noodles and continue to stir and toss. The water will cook/absorb into the noodles, if you find you don’t have enough, you can add up to 1/2 cup of hot water to cook the noodles. 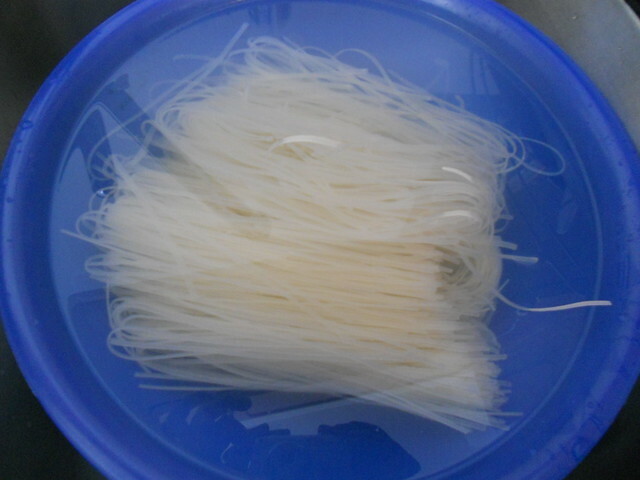 Do not over cook the noodles as they will become soggy and break apart. They should reach the perfect chewy mouth feel after about 5 mins of stir frying. Taste and adjust salt as needed (adding more fish sauce or even a tiny sprinkling of salt), add black pepper to taste, a squeeze of lime juice at the end for a nice acidic pop, and scatter fried garlic chips and thin ribbons of omelet on top for extra flavor. The boys loved it and it barely took 20 mins to make. *pats self on the back* You can substitute any type of meat for the turkey. Pork and Shrimp is a great one, or even just shrimp alone. The same for the veggies, use any combination you wish.